You, me and the gatepost! 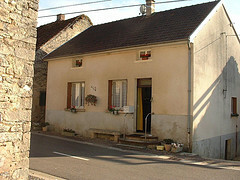 We had taken a holiday in the Morvan area of Burgundy that summer and had been investigating buying a house. After my stroke that had to go on hold along with the rest of my life. From active to immobile in one foul swoop didn't suit me one bit. My love of travel wasn't going to stop me either and in 2002 we took another holiday to Burgundy, we enjoyed just being on holiday. until George picked up a property magazine from outside an estate agent's and in the small ads we found a house, within our range and we liked the sound of. But finding the right house for someone in a wheelchair was not going to be easy. We found the estate agent who took us to view the house and it suited us perfectly. All the living area on the ground floor, doors wide enough to use my wheelchair indoors if need be all it needed was redecorating, and a kitchen! We put an offer in straight away and before we returned to England - we were buying a house! It was strrange when people asked did we bring back souvenirs? Yes, a house! The house was in a hamlet 45 minutes north of Dijon, within easy access of all four departments of Burgundy and the neighbours fantastic. They accepted these strangers who mangled their language, but they don't speak English so they helped and encouraged us. Everything that happened in the commune we were invited to and we made so many friends. We found a French class at Montbard, 30 minutes away, we joined Burgundy Friends an internet based group of people who have settled in Burgundy, have second homes here or just love the region and our social life began. I had a bad relapse in 2005 and spent two weeks in hospital and four weeks in a rehabilitation centre before returning home and recovering with my husband's help. Then in January 2006 George was taken seriously ill and we realised we would have to move nearer commerce, doctor, bank and pharmacy. We loved our peaceful village home, a stream at the bottom of the garden, the visiting commerce of baker, grocer, butcher, greengrocer; all of whom had become friends. Now the search was on for another house and moving was going to be hard.